Collectible dog bookends range from antiques, such as Bradley and Hubbard's cast iron bull dogs from 1925 to contemporary whimsical dachshunds made of bronze coated polyresin. Throughout history many humans have considered dogs to be much more than just companion animals. With their loving nature, loyalty and intelligence dogs have earned a special place in the hearts of many people. Dog bookends have become a favored collectible of many canine lovers. Many of these collectors search for bookends of a favorite breed or type of dog. Others look for bookends from a certain era, type of material or particular manufacturing company. Once necessities to keep books from cascading off of shelves, bookends still hold books in place but today they are also a unique decorative home accessory. In addition to Bradley and Hubbard several other manufacturers of early dog bookends include Jennings Brothers, Hubley and Judd. 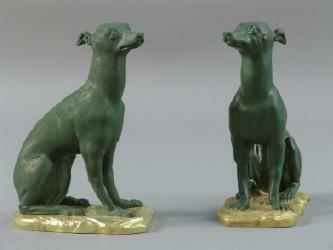 The following are examples of antique dog bookends with a known maker. Beautiful silver finished English or Springer Spaniel / Setter bookends by Jennings Brothers show remarkable detail and intaglio eyes. Cast iron with a rich bronze finish, the CT Foundry created these exquisite Art Deco Wirehaired Fox Terrier bookends. French Bulldogs or Boston Terriers made of cast iron are from Hubley or Bradley and Hubbard. Lenox bookends with a hunting dog standing on his hind legs. Scottie dogs have a beautiful patina and weigh almost six pounds. A pair of elegant Afghan hounds sits proudly on marble bases. Bronzed metal Art Deco Pointer dogs would make wonderful bookends for any hunter. Originally made to decorate the mantle or hearth of Victorian homes in the late 1800s, these cast iron Saint Bernard dogs, complete with keg, will look stunning as bookends. Art Deco carved wood Airedale bookends have realistic looking glass eyes. Made in Japan Poodle bookends with gilt accents on a highly glazed finish are from the 1950s. Contemporary dog bookends range from classic replicas of earlier designs to bookends that add a whimsical touch to your home, such as these bronze finished solid brass smoking Bulldogs. Bellacor offers Emerald colored dogs by Elizabeth Marshal. Artist Fernando Ferrera crafts smiling hand painted hounds from paper mache and cedar wood. Orvis sells these bronze Labrador bookends that are created using a unique cold casting method. Whether you love dogs, books or antiques, there are certain to be collectible dog bookends that will look lovely in your home or office.